Good morning friends!! 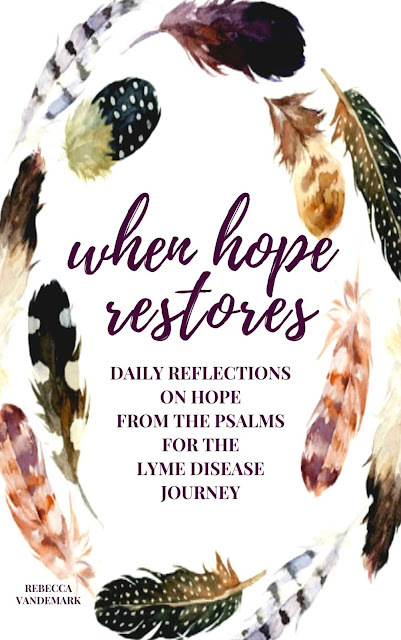 I am so excited to share with y'all the final cover design for When Hope Restores (the 2nd edition of "Path of Hope") that will release THIS Thursday- October 4th! This 2nd edition of "Path of Hope" has been expanded and updated (and with a new name!)! I am excited for these changes that keep the original content yet add to the book some exciting extra details. I am truly so overwhelmed & humbled by the beautiful support & reviews that this book receives. It is hard to believe that there are more than 10,000 copies of this book in print (in both the English and other translations). It truly overwhelms my heart. Looking for my other Lyme Disease books? You can click on the links below! I am SO incredibly blessed by each of you. Thank you so much for your support of all of my writing & books! I have heard it said that writing can be a lonely journey, but it is the farthest thing I have ever felt due to each of you! I am so incredibly grateful. Thank you for everything! I hope you have a wonderful day!